Welcome to the home of Modcan Synthesizers. Modcan offers modules in 3 different formats. A series is the original format with banana jacks. friendly rack sizing and 1/4" jacks. The new Quad Envelope does for envelopes what the Quad LFO did for LFOs. Each of the four envelopes has a jack gate input and CV control. The gate jacks are switching type and "normaled" together to allow triggering all 4 envelopes with one trigger. Plugging a patch cable into the other gate jacks removes them from the mult for independent triggering. 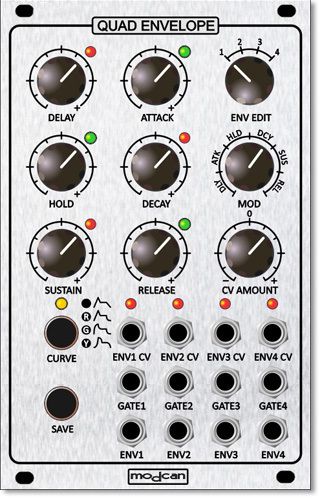 The 4 channel CVs can be routed to modulate the envelope durations with CV amount depth for each mod destination. Any or all envelope stages can be modulated simultaneously with both positive and negative CV amounts resulting in shorter or longer time durations. There are 4 possible envelope shapes built up from various combinations of expo, log and linear curves. The bi-color LEDs indicate the amount of CV modulation by their brightness with green for positive and red for negative. This provides some visual feedback about the modulation routing when switching between envelopes. The Quad Envelope has built in memory storage to save all parameters between power cycles.